If one of your New Year’s resolutions is to spend more time with family and friends, a swim with dolphins in Cancun may be the perfect chance to do so. Today, we’ll tell you about three ideal habitats for this activity. In the Mayan Riviera, there are many natural spaces to enjoy the biodiversity in the area, and several activities that will show you the flora and fauna that makes this place a unique and very popular destination for both locals and foreigners. 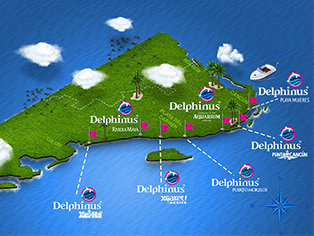 That is why we share with you the best 3 places for swimming with dolphins in Cancun with your family and friends. You will be delighted! We’ve talked about this magnificent port previously, excellent for relaxing and being in contact with nature, especially with dolphins. Here, you can share the experience with 9 other people and, on top of this, you will enjoy a 100% natural habitat located only 33km from Cancun. Punta Cancun is so magical that the boxing legend, Muhammad Ali, chose it to swim with dolphins in Cancun. Located at the very heart of the hotel zone, it is a very exclusive experience with the most intelligent mammal in the ocean. This area is located inside one of the most luxurious hotels in the Mayan Riviera: Hyatt Ziva, where you’ll find a semi natural space for dolphins. Its water comes from a cenote that is part of a lagoon system, full of algae and marine flora, which is why the color of the water is green. This aquarium in Cancun is the only one in the area and, besides learning about marine ecosystems and its more than 1,195 species, you will live the incredible experience of swimming with dolphins with all your friends. Located in La Isla Shopping Village, this place is made for you and your group of friends to discover the marine world together. Dolphin Ride: offers the possibility to live this experience with 9 of your friends, this swim with dolphins lasts 30 minutes. Splash: for up to 10 people and includes over 14 activities, such as dancing and jumping with dolphins. Primax4: if you’re going with your family, and there are 4 of you, this interaction is made for you and you will enjoy it for 45 minutes. So, which is your choice: The Cancun Aquarium or the exclusive hotel? Don’t think about it too much! Book now and discover the joy of swimming with dolphins in Cancun!